Now that we are about to enter the summer season, we thought it would be nice to share some travel highlights for when you’re in the area. 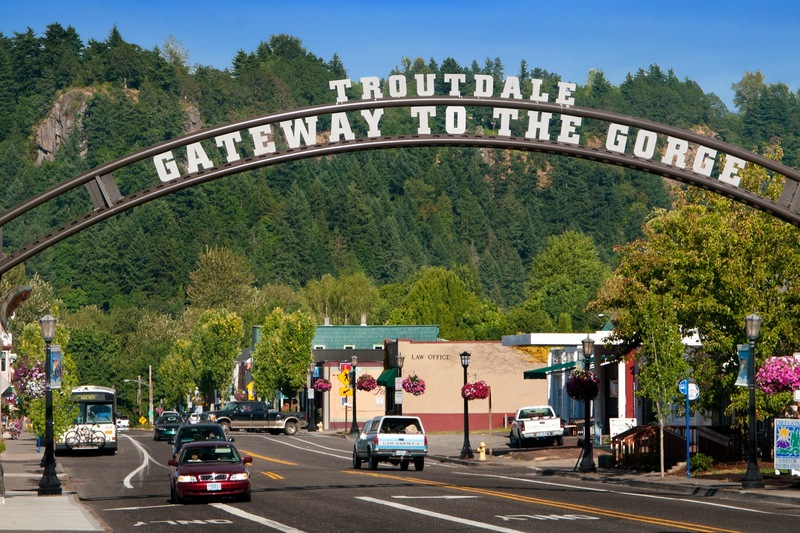 This week we would like to share some restaurant recommendations for when you when passing through Troutdale on your way the Multnomah Falls. We are fortunate to have many excellent choices right here on “main street” otherwise known as East Columbia River Highway. All of the restaurants listed are family friendly and many offer outside seating as well. Ristorante Di Pompello: fantastic Italian food featuring a full variety of classic dishes (vegetarian offerings, too). Lunch and dinner options, including fine wines and beers. Così delizioso! Troutdale General Store: breakfast, lattes, soups, sandwiches, desserts and an old fashioned ice cream; or just skip all that and pick up some yummy candy. Celebrate Me Home: enjoy breakfast pastries, sandwiches, salads, soups, and coffee drinks, all in the comfort your—we mean their—living room. Siam Sushi: awesome Asian food in the Thai and Japanese traditions. Over 2 dozen sushi rolls to try, along with noodle and curry dishes—OMG! Ye Olde Pub: just as you would imagine; pub fare including steaks, hamburgers and frosty beverages. Cheers! Brewligans Bottle Shop: enjoy some of the best microbrews the Northwest has to offer. Pair you brew with one of their signature gourmet hot dogs and park it on the picnic bench. Taste of Village: if you’re craving Chinese food, make this your stop. Choose from a full menu of all your favorites. Try one of the house specialties or something new, but don’t forget the fortune cookies. So remember to make time for us on your way to the Gorge or on your return. 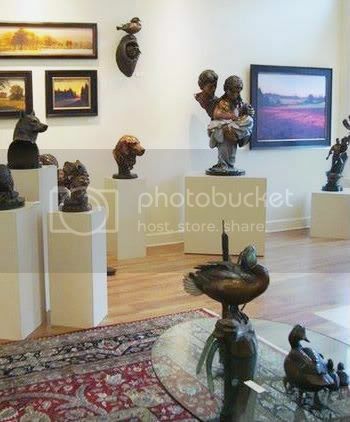 Troutdale is full of interesting shops, galleries, and parks. We are so happy to be including Carlos E. Noriega in our Gallery lineup for the months of May and June. Carlos started his interest in photography as the yearbook photographer at Chowchilla High school in the Central Valley of California. As a fighting Sea Bee in the U.S. Navy, he served two tours in Vietnam and photographed construction sites in the DMZ. After returning back to the civilian world, he had a long career in law enforcement. As a police officer, he applied his skills as a crime scene and autopsy forensic photographer. Carlos now devotes his time to photographing some of the most beautiful sights of the world. He loves to travel and capture the essence and spirit of a place through his images. Some of his most favorite subjects are the National Parks. His wildlife photographs are a specialty. This collection of photographs is from trips this past fall to Yellowstone, the Grand Tetons, and the Columbia Gorge. 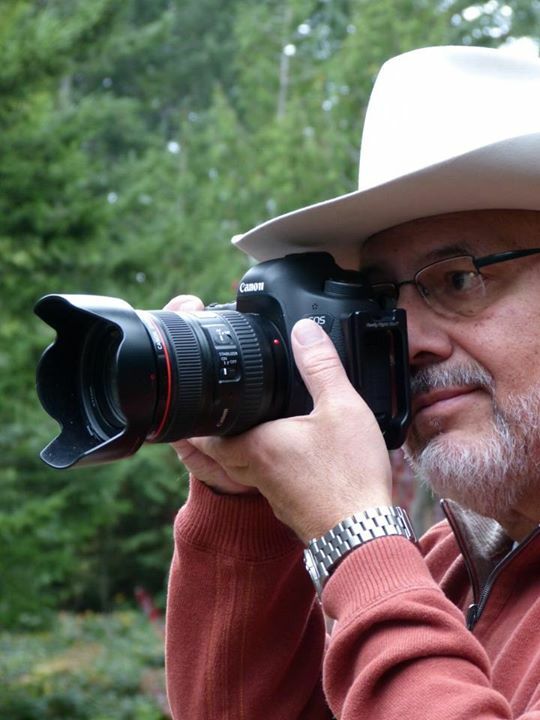 Carlos shoots his images with Canon 5D Mark III, and Canon 7D, with 100-400 telephoto lens. 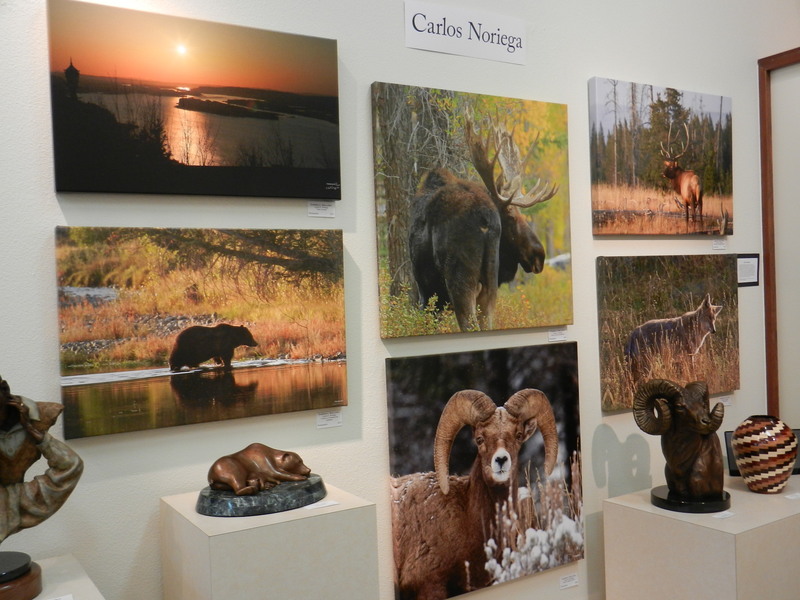 Take a mini wildlife vacation and come by to see Carlos’ fantastic photographs. 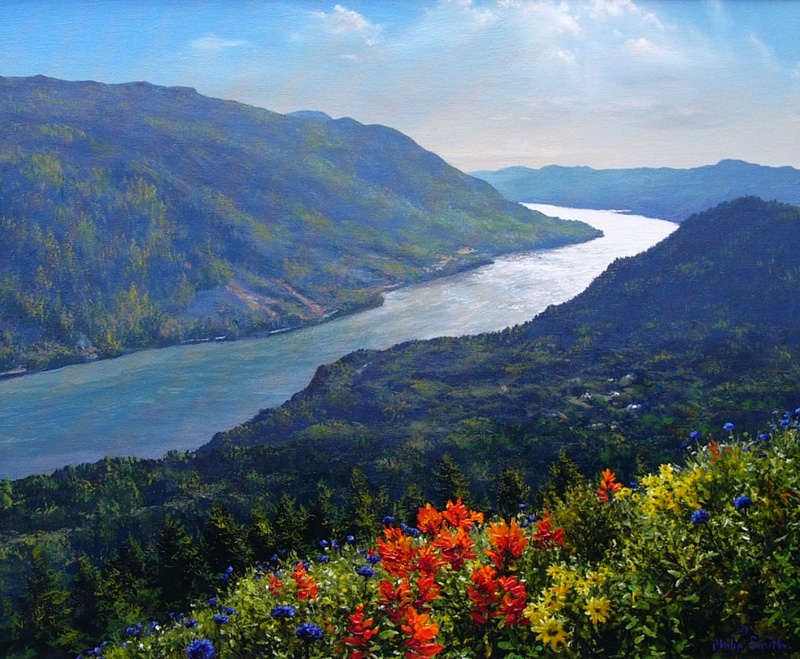 Also in the Gallery for the months of May and June is Portland painter, Philip D. Smith. 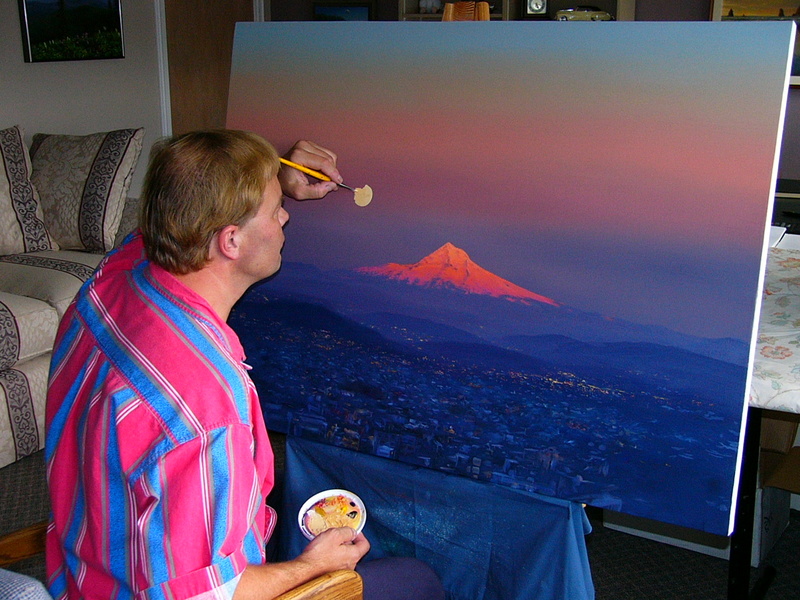 Phil has been painting for over 35 years. He was born legally blind and has limited vision in only one eye. Because of this, his innate perception of color, light and depth is amazing as demonstrated by his paintings. Phil paints in acrylic and oil and has explored a full range of subject matter including landscape, seascape, still life and portraits. He has displayed in art shows hosted by Artists with Disabilities, Beaverton Arts Commission, Canby and Welches Art Fe stivals and most recently in the Audubon Wild Arts Festival in Portland. If you haven’t seen Phil’s work, don’t wait any longer! Come in and see this artist’s amazing work. Image: Dog Mountain Trail, 20 x 24 inches; The artist at work. For the months of May and June we delighted to feature wildlife artist, Peter Mathios, whose work gives specific meaning to our exhibit title “Is it Real or is it Kodak”. If you’ve been to the Gallery over the past week or so, you’ve seen Peter’s work and were surely amazed at his mastery of detail and ability to create a photographic snapshot with the use of a paintbrush, rather than a lens. Peter has been painting since he was a child. Inspired by memories of hunting with his father in Northern California, his favorite subjects are ducks and other waterfowl. Behind each of Peter’s paintings is inspiration that comes from past experiences. There has to be that breathtaking moment when light, color and wildlife come together in a harmony that strikes the core of his soul in order for him to create a painting. Moments like these usually stem from childhood memories, and for Peter, they originated from hunting ducks with his father and brother in the Suisun Marsh of Northern California. During this time, he became increasingly interested in the different species of waterfowl and continuously drew them. Peter copied wildlife photos that appeared in hunting magazines as well as the fantastic hunting scenes he longed to experience during the off-season. This passion soon led the artist into the world of wildlife conservation and supporting the groups that purchase, enhance and maintain our wildlife habitat. Whether observing the majestic beauty of a bull elk on a frosty mountain meadow or the sleek elegance of a Northern Pintail, Peter wants to share these moments in nature through his paintings. Peter was the 2009 Ducks Unlimited International Artist of the Year and he designed the 2010 DU National Stamp and 2010 Texas Duck Stamp. His work was featured in the 2008 Pheasants Forever National Art Package as well as in numerous DU national merchandise packages. 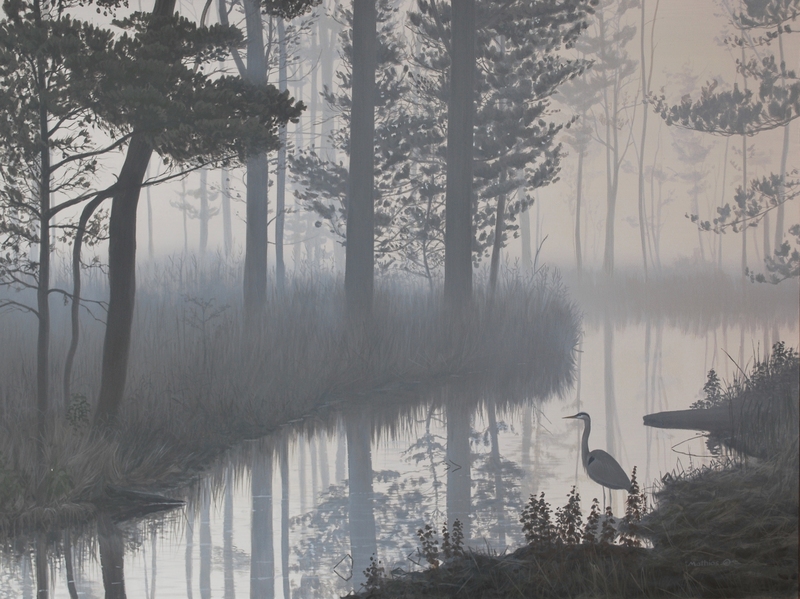 In 2006, he won the Michigan Duck Stamp contest. 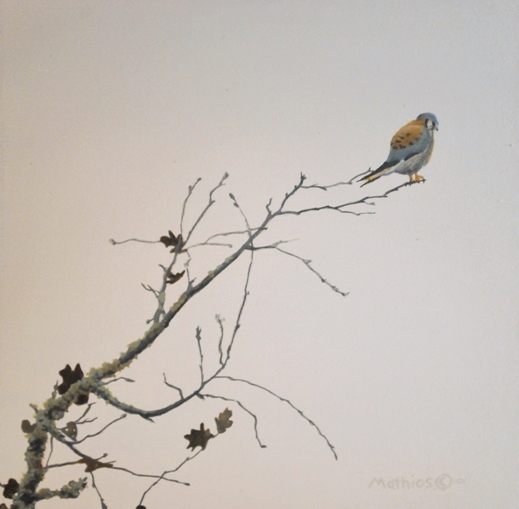 He has been juried into the prestigious Birds in Art exhibition at the Leigh Yawkey Woodson Art Museum numerous times and annually participates in the prestigious American Miniatures Show at Settlers West Gallery in Tucson. US Art magazine named him one of the ‘Young Guns of Wildlife Art’ in an editorial describing up and coming wildlife artists. He has also US Art and California Waterfowl magazines. Internationally, he was commissioned to paint the 2001 New Zealand Fish and Game Habitat Stamp. Peter paints in acrylic and is a full-time artist. He makes his home in the Willamette Valley. Rip and his son Chad have recently returned from a trip to Italy, where they studied the work of Renaissance masters Michelangelo and Bernini, among others. After this trip, Rip is more passionate than ever to transfer his fresh inspiration into the Ascending Christ monument he is currently sculpting. This is the third commission Rip has received from the Diocese of Wichita. He was selected after a nationwide search more than a year ago to create two original sculptures as part of the 18-month renovation of the Cathedral of the Immaculate Conception. 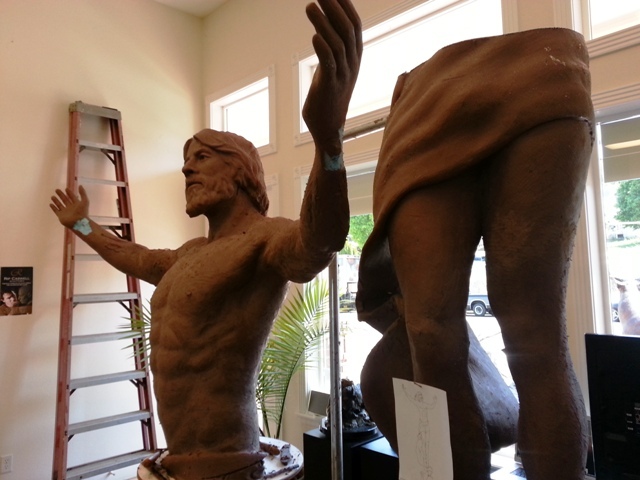 “Mary and Joseph” and “The Crucifixion” each stand over seven feet in height. The Ascension Cemetery is located ten miles from the Cathedral in Wichita. It is visited by over 10,000 people annually. The new sculpture will be placed at the north end of a plaza on the cemetery grounds. It is a gathering place for ceremony and remembrance. The design of the contemporary plaza includes 12 black marble columns varying in height, representing the 12 tribes of Israel. The columns gradually rise toward the tallest in the center, which stands at a height of 18 feet. The Ascending Christ will be placed atop this column, standing a dramatic 30 feet in the air above the plaza below. Be sure to visit the Gallery and watch the process as Rip sculpts this magnificent monument.